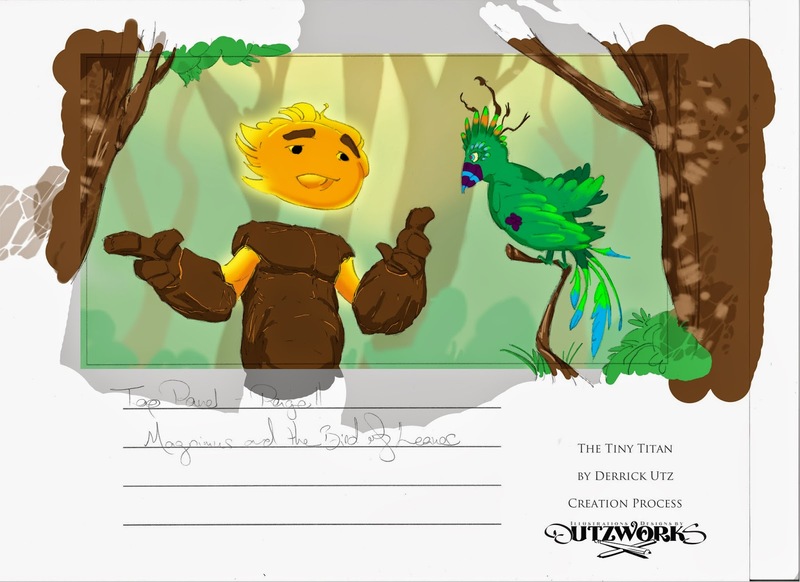 DutzWorks - Illustration and Graphic Design by Derrick Utz: Bringing a Myth to Life - Creating The Tiny Titan!!! 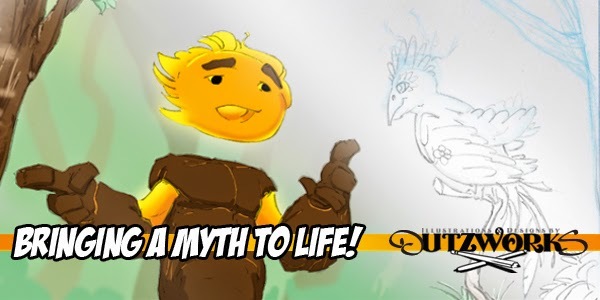 Bringing a Myth to Life - Creating The Tiny Titan!!! With this post I wanted to take a few moments and show the process for some of the art for my current major personal project. At this point the story it titled "The Tiny Titan" and is a loose play on the myths of the ancient Greeks. In my story I take the idea of the great elemental titan creatures and I add a more structured family system to them and play with the idea that they even have young yet powerful demi-titan children who command lesser elements. This first story centers around a young demi-titan named Magmamus. He has a lot of growing up to do and his family do their best to point him in the right direction. If this story is a success there may be additional ones after I create at least the first installment of my other book, Bot's Amusement Park. 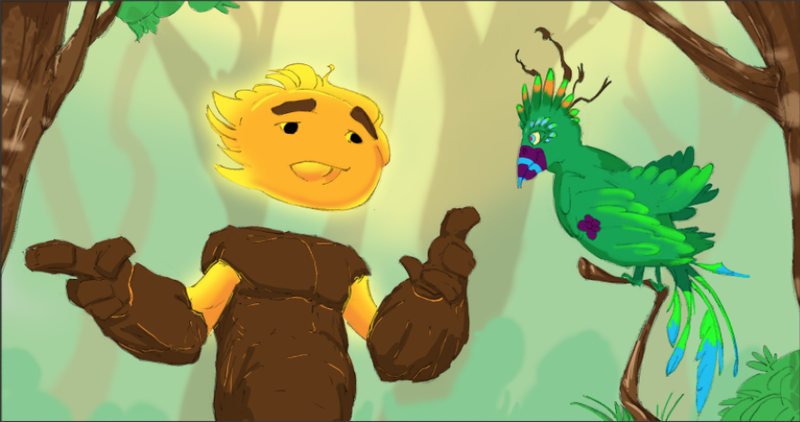 With Bot's I will be trying a neat spin on the way I normally do an illustrated story so working on that story should give The Tiny Titan the time it needs to grow into something bigger if it is meant to. If it does then I will be able to possibly skip back to it and write a second tale of Magmamus and his home of ancient Greece. Well, outside of the story, the art has been a great deal of fun but also had it's trials for me too. See, I come from hand drawn, penciling background. I really enjoy that medium but that additionally has it's drawbacks. First of all, I generally don't like inking. I feel that I lose some of the energy of the original line when I add ink to the page. Click Below for more of the story of this piece and it's art!!! 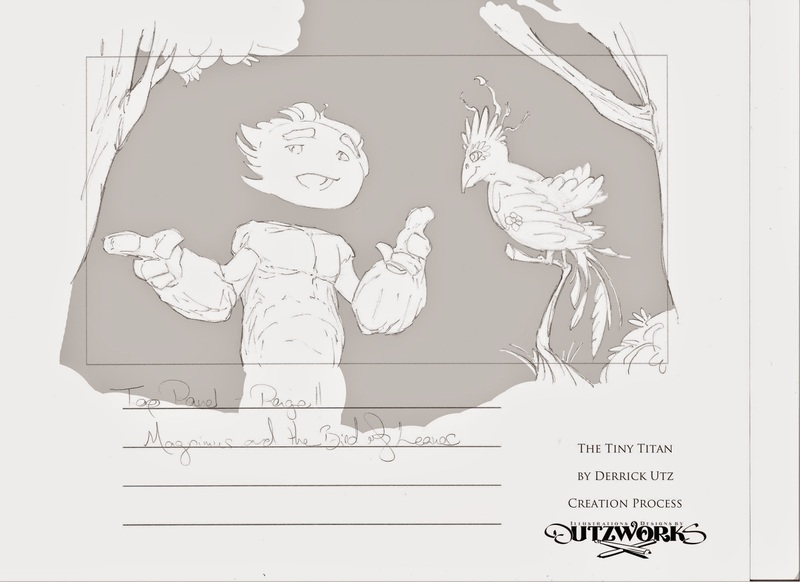 Lets have some fun and watch how this panel from The Tiniest Titan was built in the layers from thumbnail sketch to digital painting! I know that this is really just in my head because the comic industry has some absolutely amazing inkers and their work explodes with life, that is just not where my skill level is. Additionally, I grew up studying some really amazing pencil artists, one of which was a professional but rarely had his work inked. Instead, his work was so tight the Colorist could scan it in and after making a few adjustments, could go right to the coloring stage and it was amazing. The penciler's name was Michael Turner and the colorist is Peter Steigerwald. So, I really skipped a great deal of working with ink and I am just now learning it to add it to my creative arsenal overall. Though I did not illustrate The Tiny Titan with ink, my recent experience with it during October's Inktober event has been improving the way I handle the line work. 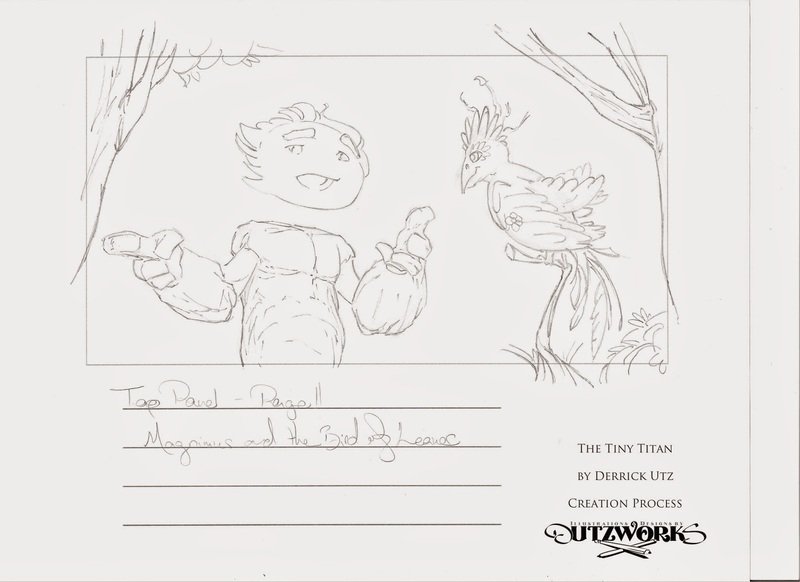 With the following pictures and comments, I want to explain the process that I am going through to create the art for the book of The Tiny Titan. At times it was a long process but I was amazed at the kinds of artwork I could create when I stretched outside of my normal illustration box. Here are the major steps of my illustration process! This is the stage where I get to explore the idea of a panel or page with the least amount of care or control. It is really the first chance I get to sketch and doodle the ideas i have written. In this stage I may redraw a panel 4 or 5 times just to explore the space in my head and excersise the concept. 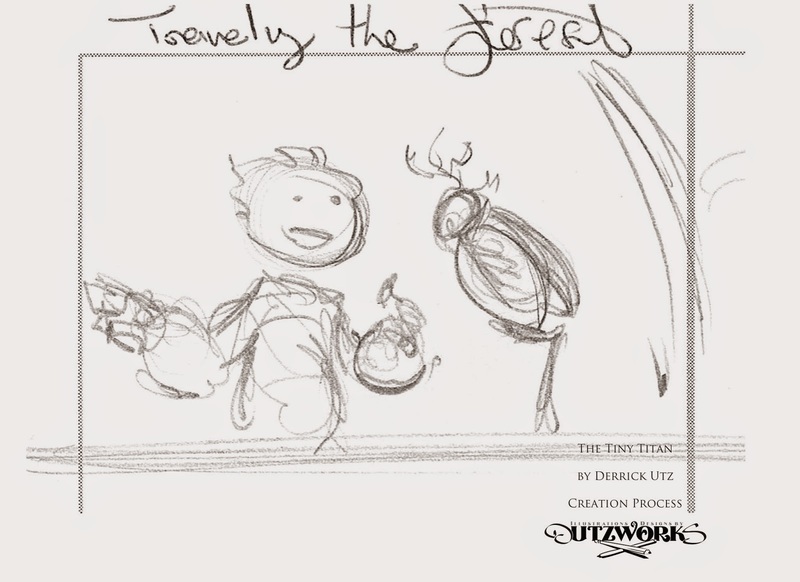 I have found that this simple step in the process is one of the most important because you create your compositions in these little drawings and you can do a great deal of problem solving and editing quickly in this step that could cost you a great deal of time later. This is the step where I take the best ideas from the former step and I rough them in on full size layout sheets that I make. This book was created to have two landscape panels per most of the pages and I knew the rough dimensions so I created very light layout sheet to print and illustrate on. I used a special pencil called a Non-Photo Blue (or Non-Repro Blue) pencil and it is designed with a very light cyan blue lead. This is great for sketching on final boards because the color is designed to basically disappear in the bright light of a scanner. This allows me to work out the composition at full size on the sheet without having to stress the perfect lines just yet. By this point in the illustration process I usually have the look and feel of the image down thanks to the layout and I spend a great deal of time laying down the crisp lines. This is always one of my favorite stages of my art projects! I love to draw with pencil and I can get pretty carried away with it when I do, lol! For this specific illustration I really wanted to enjoy the medium shot/waist up view of Magmamus and his hand gestures. 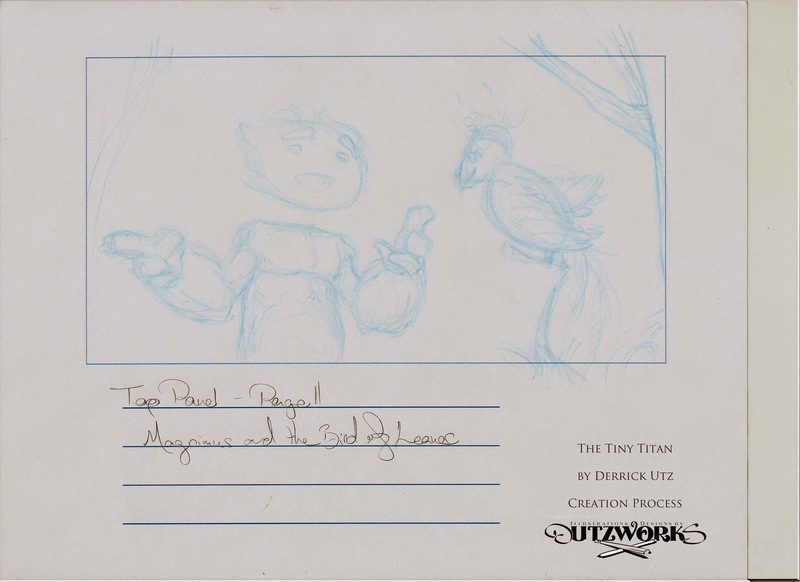 This was also the first full view we get of his new mythical bird friend. I then scan the penciled pages into the computer and take them into PhotoShop. Then I use color to separate the different areas of the illustration. That separation could be between major objects in the same area or simply separation of foreground and background. With them separtated, I could go back in very easily and work on one area or the other without risking damaging those separated items. After the areas or objects are separated into "flats" (areas using a single, flat tone of color to separate them) I am able to start putting certain areas on different layers. This allows those sections to be easily selected within Photoshop. Once these distinctions have been created in the file, I would then go to the color stage and muscle my way through some of the panels, making mistakes many times over on the way! Overall, much of the coloring process is experimentation for me right now and that is one of the reasons it takes me so long. It is one thing to draw a thing, its something else to understand how it would really work in the realm of color. I wanted to create this whole crazy thing myself too. I want to grow from this, even if it is painful growth! Well, currently I have a short number of the pages in color with only a few of them finished. I ran into a wall working on them and my brilliant wife gave me a great idea; print the pages out at a smaller size and use colored pencils to practice. Amazing! She knows me well and thought this would be a great bridge between my strengths in penciling and my weaknesses in color. I will be working on many of these panels in colored pencil over the next month if all goes well! That leads us to the finished version of this panel (below). I take the finished colors at full size, determine the best fit and crop and then trim off the outer area. This actually happens in a different program that I use for the actual book layout and production so the original color file is not really cut down, just seen through a “window” in the application. I am then able to go back to the color file if I need to reposition the frame or use it for a different area of the book. Can you believe that all of this happens on almost every one of the panels for the book!?! When all is said and done there will be around 45 separate illustrations ranging from this 8.5" x 4.5" one to larger 12" x 18" ones! Yep, this would probably be the definition of insanity in some lost ancient dictionary. I have faced more hurdles handling this than I planned and the worst one has been me. I am not the most disciplined artist and it has been very hard to force myself to sit down and work when I finish with other parts of my day. I really believe in the fun journey of this story and I have a great idea on how to share it with many people around me. That has been a huge driving force that has helped me to not put it aside like so many other projects from the past. It is a fact that we creative types can be fickle with projects, especially our own but this one has a really amazing little future and it is meant to be fun, inspiring and shared with people. I cannot be the one to hold it back. It needs to be brought to the little hands that would learn from it and the big hands that would read it to them! 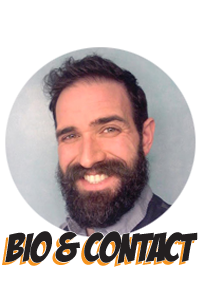 Thank you so very much for reading this epic post! It is once I have wanted to make for a long time and just wasn't slowing myself down enough to do it. Please let me know if you have any questions or comments and my very best to you until the next post on this crazy creative ship of mine one the ocean of the arts!